Indicators offers a comprehensive account of indicators and their applications in areas such as titrimetric analysis and the analysis of mineral waters. The theory and principles of visual indicators are discussed, along with acid-base indicators, indicators for non-aqueous acid-base titrations, and titrations with non-chelating ligands. Metallochromic indicators, adsorption indicators, oxidation-reduction indicators, and fluorescent and chemiluminescent indicators are also considered. This volume is comprised of 10 chapters and begins with a brief history of indicators, including the contribution of Robert Boyle in the field. The different kinds of indicators are also described, along with developments in indicators in the nineteenth century. The next chapter deals with the theory and principles of visual indicators, followed by a discussion on acid-base indicators such as organic dyes, inorganic substances, compounds capable of fluorescence, and chemiluminescent systems. Subsequent chapters explore other varieties of indicators, including indicators for non-aqueous acid-base titrations, metallochromic indicators, and adsorption indicators, as well as oxidation-reduction indicators and fluorescent and chemiluminescent indicators. 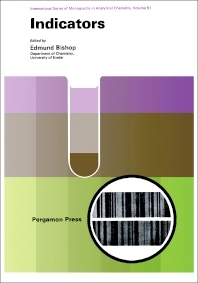 This book will be of interest to chemists.